One of my favorite spring trends right now? Floral jeans! And man, I'm pretty smitten with this Current/Elliot pair. Yep, I think we'll be getting along just fine for the warmer months ahead, with lots of breezy tanks and slouchy, off-the-shoulder sweaters. How about you guys? Got your eye on a particular pair? Do share in the comments! I like your parka and floral jeans a lot! I've got a few pairs of Zara floral pants! Adore your heels & the parka with the leather sleeves. The outfit looks so cool ! I adore the floral jeans and I just ordered myself a pair yesterday. You paired yours wonderfully, the jacket and shoes add that extra edge to a girly pair of jeans ! Love everything about this! Florals and leather is so fun! ABSOLUTLY AMAZINGGGGG!!! You always look great. Such a lovely contrast with the demure trousers and the edgy jacket! I do like the floral denim than trousers... great look, krystal! each time i see this jacket on you, i'm reminded to take my army utility jacket out of the closet and wear it more! so versatile! love the jeans. the jacket is just so great! 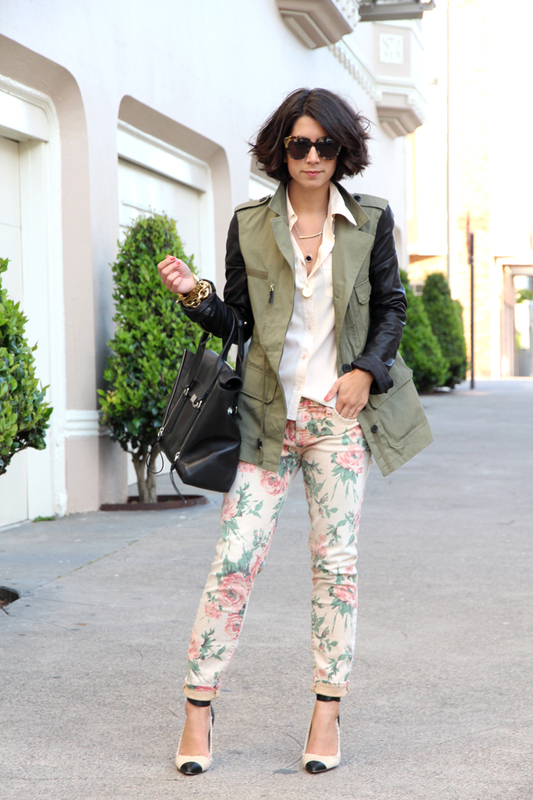 These floral pants really look good paired with leather sleeve jacket. Definitely something floral or perhaps tropical. Loving this outfit the jacket is perfection! You're KILLING me with that jacket!!! LoL rub it in that I don't have it!! :( Those shoes are awesome too! Wish I could wear them, but any shoe that puts me over 6 feet tall makes me feel awkward. I've only recently found your blog, and have honestly enjoyed all of it so far! Happy Friday!! these shoes are some of my favorites in your enviable collection! I love the floral denim and the sunglasses! I haven't found any that I love but yours look fantastic, and the shoes go great with them! you've got so many awesome jackets, i love them all! & i really like how you paired the jacket with floral pants, it gives them such a different look! Great! I need that jacket! Those jeans are absolutely perfect! Love the whole outfit! Oh I love floral jeans, want a pair so bad! The colors of this outfit are perfection! I love the light shades paired with olive and black. So perfect! I love the jacket and the flower pants! I absolutely love your floral jeans! They are so so gorgeous! Love the jeans, so gorgeous! I love the print of your Current/Elliot pair with the cargo jacket; great styling, as usual! I'm longing for this blue and white floral pair (http://bit.ly/KvxCOo) and any of the DVFxCurrent/Elliot styles. Those jeans are definitely on my wishlist!!! I love this look! Fabulous outfit, love the entire outfit!! I love your jacket and shoes! You look stunning! 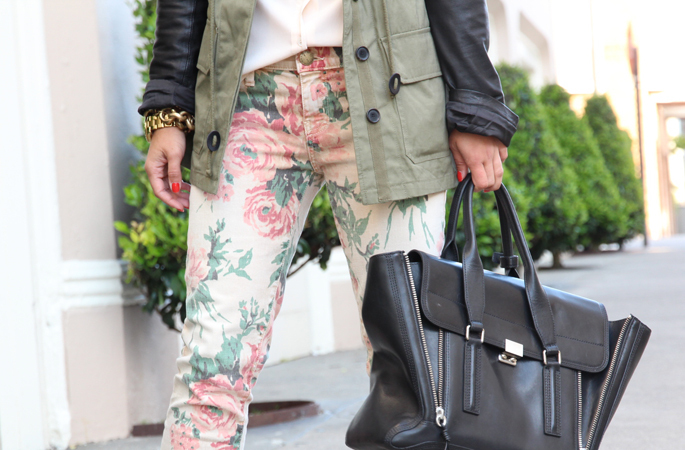 I like this fresh take on floral pants! So nice to see them with something other than a chambray shirt! You have the most amazing shoe collection! Do you have any tricks for keeping them in such good condition (especially when they're climbing San Fran hills on a regular basis)? love your floral jeans!!!!! great way to pair them! so lovely! I've always wanted the current/elliot floral pants! I can beleive how much i love these pants. You look absolutely beautiful. Super cute, Krystal. I'm a big fan!! Love this! The jacket looks great with the floral denim! Fabulous edgy/feminine contrast. This amazing jacket is sold out everywhere and I want it, you look fabulous by the way. Loving the floral print jeans. I really love the floral pants, the pink flowers are gorgeous.